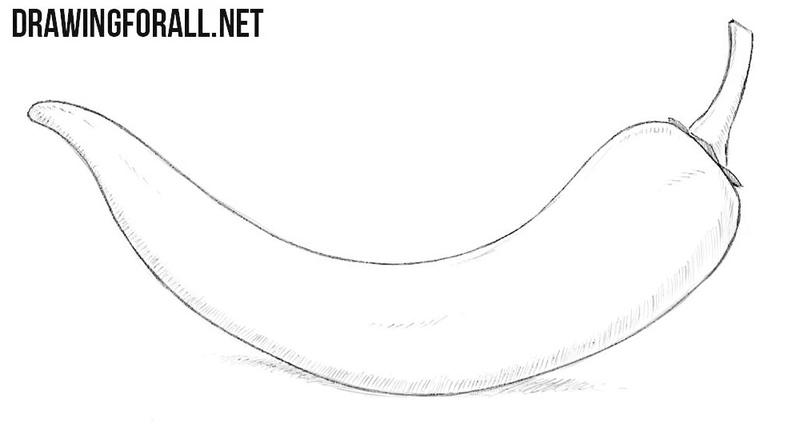 Today we will tell you about how to draw a chili pepper. We are very lucky because have the opportunity to use hot pepper as a spice. Scientists say that pepper has passed an evolutionary selection due to the fact that it has become very bitter and burning. Сrusted anthropoid apes could not destroy it and eat it because of its bitter taste. 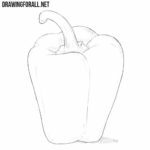 First draw the outline of this beautiful pepper. Pay attention to the smooth contour of the pepper. One end of the chili should be large and rounded and the other end should be pointed and thin. 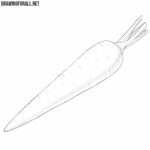 The lines on the drawing of the vegetable should be very smooth and smooth. In this step, we just add the contours of the stem and short leaves. Pay attention to the fact that the stem in shape is a continuation of the pepper. 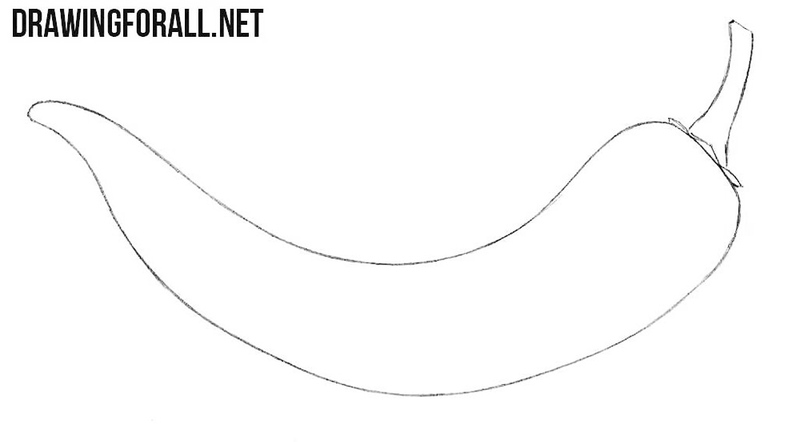 If you draw a bend in the other direction, your drawing may lose realism. 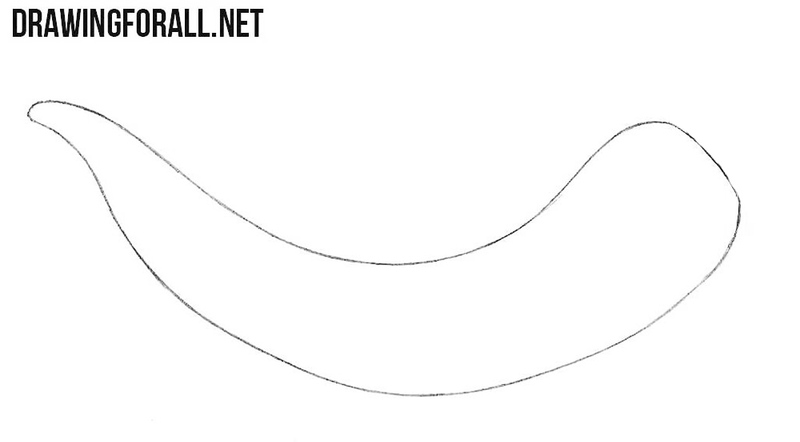 If your actions were correct, then your chilli pepper drawing should look like what you can see below. We have almost finished drawing hot chili pepper. Now we need to add a light shading to the bottom edge and to the surface. On the very body of chili pepper draw a short shading that goes along the pepper to display the texture of the vegetable on a piece of paper. 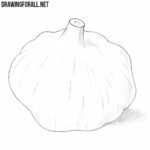 If we helped you to learn how to draw a chili pepper, dear readers and subscribers, it means that our efforts and our works were not in vain at all. We did not do the most difficult work, however, we drew a hot pepper and this is very cool. The fact is that pepper is often used as a logo or a symbol of something. 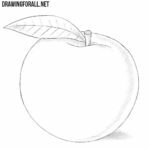 In addition, you can use your knowledge gained from this lesson to learn how to draw better still lifes. 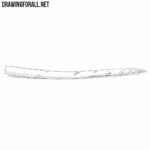 We truly love this ancient art genre not only because of the ease, but also the fact that you can improve your knowledge by drawing still lifes. We hope you get a great realistic pepper. See you again! We went to do a new drawing lesson for you!